Six-way tie at Foxwoods… GM Ashley qualifies for U.S. Championship!! Going to Foxwoods Open is quite a unique experience! The World's largest casino is secluded "smack-dab" in the middle of a vast forest… hence the name Foxwoods. The closest major airport is T.F. Green in Providence, Rhode Island (45 minutes) away. Nevertheless, the site is an absolute pleasure to play in and differs from Las Vegas casinos in that they were separated from other areas of the hotel… good for chess players who prefer not to mix the two. However, there were a fair share of red-eyed players walking around the tournament. 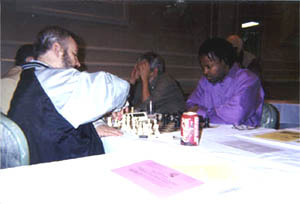 GM Alexander Ivanov vs. GM Maurice Ashley in last round encounter. The game was drawn. The top two boards ended in rather quick draws while Wojtkiewicz-Benjamin also ended peacefully. That left a hard-fought battles on boards #4 and #5. Ivanov-Ashley ended in a bitterly-fought draw while in Kaufman-Kacheishvili, the Georgian equalized early and finished Kaufman in a 22-move miniature. These results left the following players with 5½ points: Smirin, Ibragimov, Kaidanov, Goldin, Benjamin, and Kacheishvili. 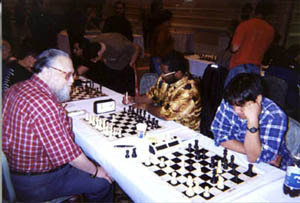 Both GM Ashley and IM Kaufman qualified to compete in the 2003 U.S. Championships in Seattle. Others qualifying were: GM Alex Stripunsky, IM Michael Mulyar, FM Igor Foygel and NM Alan Bennett. This tournaments was interesting in that many U.S. chess luminaries failed to finish after losses took them out of the running. GMs Alexander Shabalov and Nick deFirmian withdrew as did U.S. Champion Larry Christiansen and John Fedorowicz. As far as the "Drum Majors" were concerned, GM Ashley was the star by clinching a spot to compete in the U.S. Championship. After just missing the berth in last year's U.S. Open, Maurice will be the first player of African descent to compete in this prestigious event adding to an ever-growing list of accomplishments. Coming off his IM norm at the Penn State Masters, NM Norman "Pete" Rogers finished with 4 points. Pete told The Drum that he will make an attempt to clinch the 3rd and final IM norm at the World Open in July. 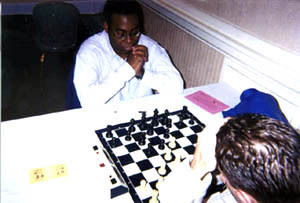 FM Emory Tate, one of the most active players on the circuit, did not participate. Other Drum Majors didn't fare so well. Jerald Times was 0-2 before withdrawing and Ernest Colding scored 1-4. In regard to players of African descent, Okeckukwu Iwu (pictured above left) tied for 1st in the U2200 after winning a tense last round encounter against Vladimir Yershov. At one point, Yershov trapped Iwu's rook, but failed to see a winning sequence of moves that would have won it outright. Quite an expensive mistake. Sylvester Smarty (native Nigerian) scored 4½-2½; Glenn Umstead and Daaim Shabazz scored 3-3 (neither played round 7). Experts Devlin Sinclair (1-5), DaQuan Baldwin (1-5) and Wallace Gordon (1-4) had tough tournaments. In the U2000 section, notable performances were turned in by Ervin Matthew (5-2) and Peter Moss (4½-2½); 1870-rated Tiffany Remsen scored 4-3 as did Kenneth Moody. Brooklyn's rising star Roderick Scarlett had 4-3 in the U1800 section. Editor's Note: My sincere thanks go to Don Colbert for his gracious hospitality for helping me catch my 6:20am flight (!) and for arranging an interview with The Chess Drum. Well done!